It’s surprising there aren’t more VR ports on Nintendo Switch. Sure, you can’t enjoy the sensory immersion of wearing a headset, but with the support for motion-controls via the Joy-Cons there’s a huge amount of potential to utilise the console’s unique hardware features. Thumper made a fine port from VR to Switch and Surgeon Simulator CPR is looking to do the same. But can Wales Interactive’s new-ish arcade-style shooter keep that tradition going and send ripples across space and time? Well, that depends on what you’re looking for in a shooter. Do you want something ultra-realistic, with believable physics and a real-world story? Or do you want to be a time-travelling soldier who hunts dinosaurs, destroys robots, maims mutants and fills the fantastical undead with bullets galore? Because Time Carnage is absolutely the latter, and then some. There’s some nonsense about using time travel to find a new frontier for mankind, but really it’s just an excuse to shoot consecutive waves of mutated dogs with a pink crossbow. 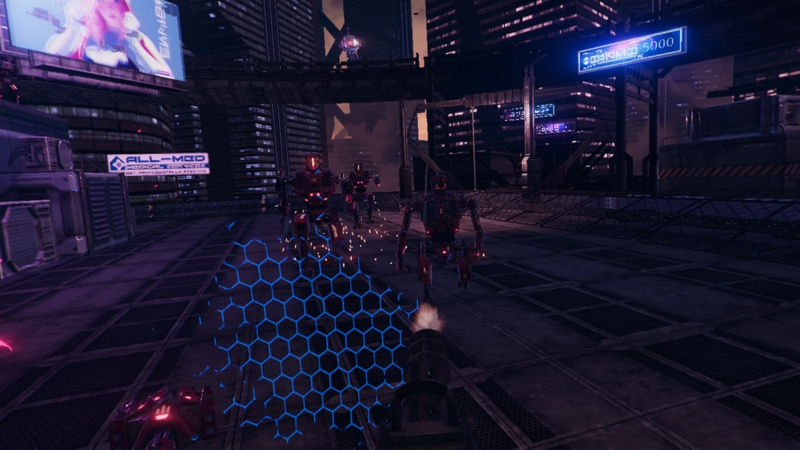 Since Time Carnage was originally designed with the navigation limitations of a VR headset and setup, the game doesn’t operate like a regular first-person shooter. Instead, you’re stuck inside a static forcefield that arrives in four very different time periods. From inside this small futuristic dome, you have access to four weapons, with two assigned to each hand. You can flick between each respective pair by pressing ‘L’ and ‘R’ respectively, and while you only have a choice of a handgun and an Uzi at the very start of the campaign, the further you push through its four separate chapters the more you’ll unlock. Weapons only have a certain number of bullets per magazine, and you won’t be able to reload manually. Instead, you’ll have to hit either of the shoulder buttons to switch to your other gun, which will then allow the unselected weapon in either pair to gradually refill. It’s a neat alternative to the simple reload action and forces you to be mindful of which gun you’re using for a certain enemy. Is a tough brute of a robot or giant mutant looming in the distance? Then you’ll need to make sure your high-velocity sniper rifle or grenade launcher have sufficient rounds. And with a little audio cue to remind you when each weapon is refilled, you always know exactly how much firepower you have. The real fun here is experimenting with different combinations. Each weapon has a set number of shots, as well as a unique reload speed and damage rating, so you’ll find yourself swapping new ones in and out in the pre-launch menu, selecting which side you want a certain gun to sit. Are you going up against a menagerie of dinosaurs on Pangaea? 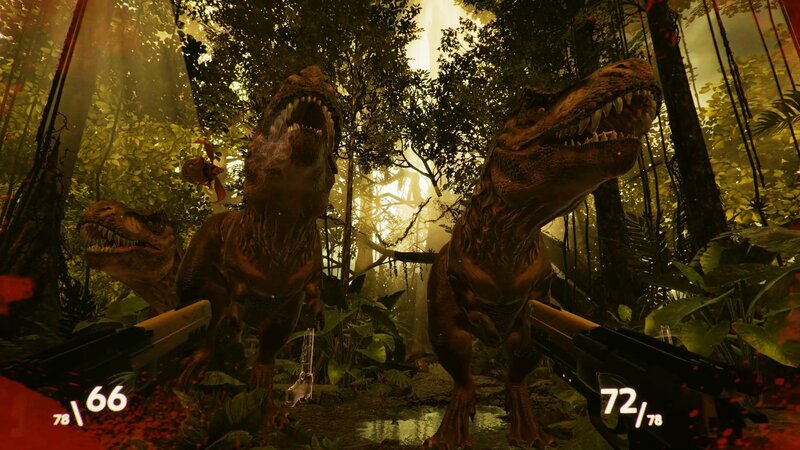 You’ll need an assault rifle to pick off flying bugs that drop acid on you, a shotgun to blast Triceratops up close, a pistol for the Raptors and a sniper rifle to one-shot a Spinosaurus. It all sounds so dumb, but a certain amount of tactical thought is rewarded. The gun physics are so ridiculous we laughed out loud multiple times during our playthrough. Ever wanted to see a T-Rex fly backwards after you’ve just headshotted it from afar? Of course you do. We’re not entirely convinced a shotgun to the face would send a Triceratops somersaulting into the air, but that sense of B-movie silliness taps into the light gun-aping shooting gallery Time Carnage is so enthusiastically serving up. 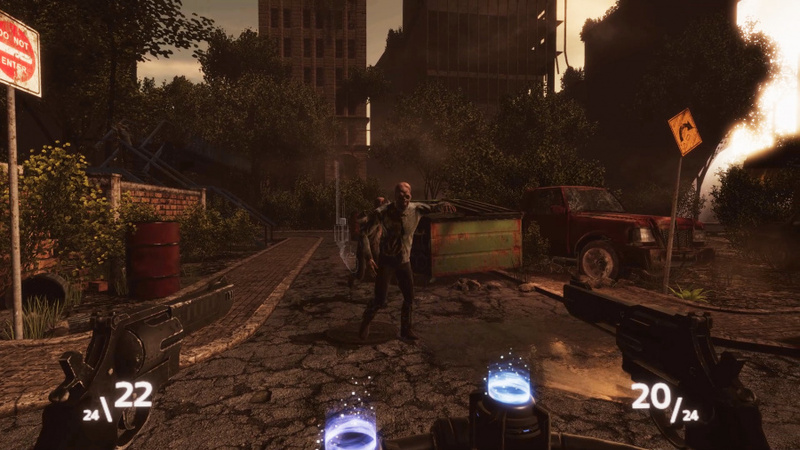 The game supports both regular movement via the analog sticks or via motion controls. Sadly, those gyro-based controls aren’t the most precise, and it wasn’t long before we switched back to using the sticks. It’s a little disappointing considering that some enemies – particularly the flying ones – are quite hard to hit, and the sheer fact that this was a VR game designed with motion control in mind. Hitboxes are also very spotty at times, with some enemies taking absolutely no damage, despite being struck multiple times. 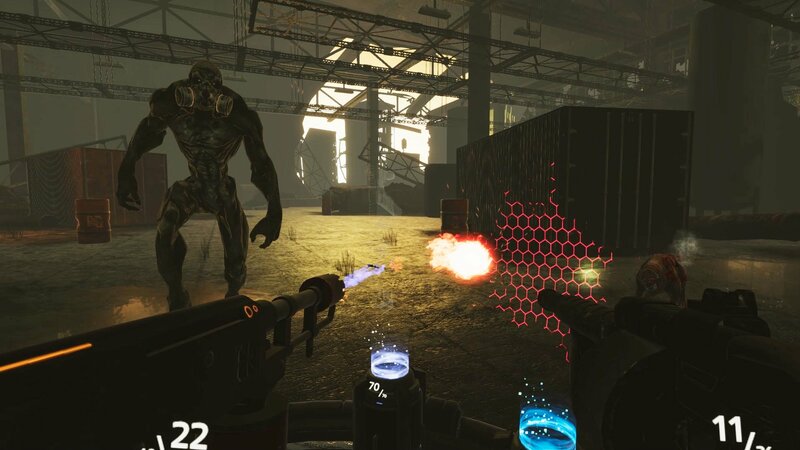 Time Carnage harks back to the good old days of heading down to the arcade to play House of the Dead or Virtua Cop, where you’d drop a couple of coins into a virtual shooting gallery and kill zombies all evening. While this indie shooter lacks the reliable precision of those light gun classics, it at least offers an enjoyable FPS alternative amid Switch’s growing selection. Unfortunately, it’s not the best VR port we’ve seen, and its own brand of ultraviolent silliness soon loses its appeal.